You can help rescue shelter animals without continually adopting dogs and cats. In fact there are lots of ways that you can help rescue groups this fall and help build the relationship with your current dogs at the same time. First of all if you see a group of shelter volunteers out with a banner and some dogs don't assume they are peddling dogs. Many people say "oh I have 3 at home I don't need more" and keep on walking. Stop to see what they are promoting. Many times the dogs are ambassadors that already have homes and are helping draw people in to learn more about what the shelter is promoting. At the very least stop, say hi ,and get some free lovins from the dogs. I am a huge proponent of getting out to do fun things with your dog to keep the relationship strong and fresh. My Side Kicks go with me lots of places and more businesses are becoming dog friendly. A way to help shelter pets plus have fun with your pooch is to attend community events put on by the shelters. The first function coming up is Hound Dog Homecoming on sept 8 11am - 4 pm It is free for the public to attend downtown at the expo center. There will be games and free contests see swh.org for more details. Dress your dog up or teach a few tricks to show off on stage. Participating in contests that shelter groups sponsor. The Humane Society is raising money through voting for Hound Dog Homecoming King and Queen. Black Betty is running for Queen and Buddy is running for King. Each vote is a dollar that helps shelter pets. The candidate who raises the most cash wins. So by participating in community rescue events and fundraisers you can help shelter pets without becoming a hoarder that is featured on TV. By taking your current pet out to social events you will strengthen the bond you have with your current furry family members. Oh- bring the kids to Hound Dog Homecoming too. Whats more fun than mixing kids and dogs. There will be face painting a bounce house and other fun activities. Labels: Lindy in the drivers seat waiting for me to drive her around. 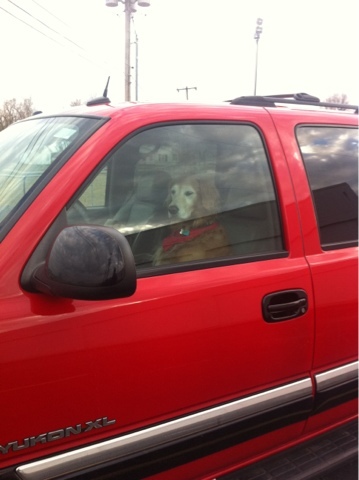 The dog in the car look very cute and innocent. He also get a chance to seat and enjoy the riding.